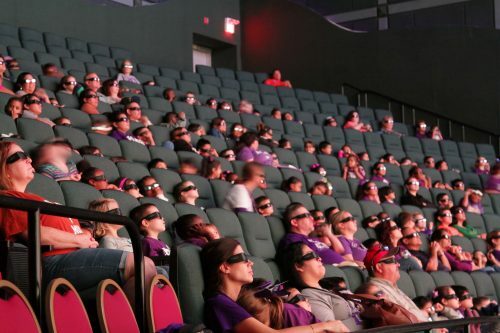 If you have been to our MG 3D Theater at Moody Gardens you would probably agree that it is pretty impressive for a number of reasons. 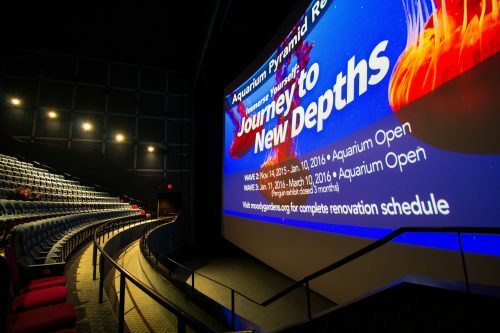 Not only was it the first 3D Theater in North America, but is the biggest screen in Texas and just a little over a year ago was introduced as the world’s first 4K 3D Giant Screen 6 Primary Laser Projection System. However, did you know that it is also extremely environmentally friendly? Although our screen is 3x brighter than most traditional movie screens our system actually uses 88% less energy. The 1570 Projector system required 67.8 kilowatts an hour to run compared to just the 8.4 kilowatts required by the laser system. The 1570 Projector relied on Xenon arc lamps, a special type of gas discharge lamps that are used in equipment like movie projectors and searchlights. Before we made the switch to our laser system we would have to replace the bulbs in the theater every month. The lifetime of the bulbs was between 300 and 800 hours. Now, instead of bulbs our system uses laser modules that have a lifetime of 20,000 to 50,000 hours. Not having to replace the bulbs means we have vastly cutting down on our waste and made our theater much more environmentally friendly. This screen looks huge! I can’t even imagine sitting in a theater that big, but it sounds like it would be a great way to watch a movie. The energy saving feature is great too. Thanks for sharing. Previous Previous post: World Oceans Day! Next Next post: Get your chum ready, Shark Week is Here!